The Derby Dozen, 12 questions 1 person a whole lot of information passed along to the rest of us. 1) Whats your real name and derby name? 2) How long have you been involved with Skating? I roller skated off and on during my elementary school days. Then I started skating aggressive inline during my middle school/beginning high school days. Then I transitioned to skateboarding for 5 years. 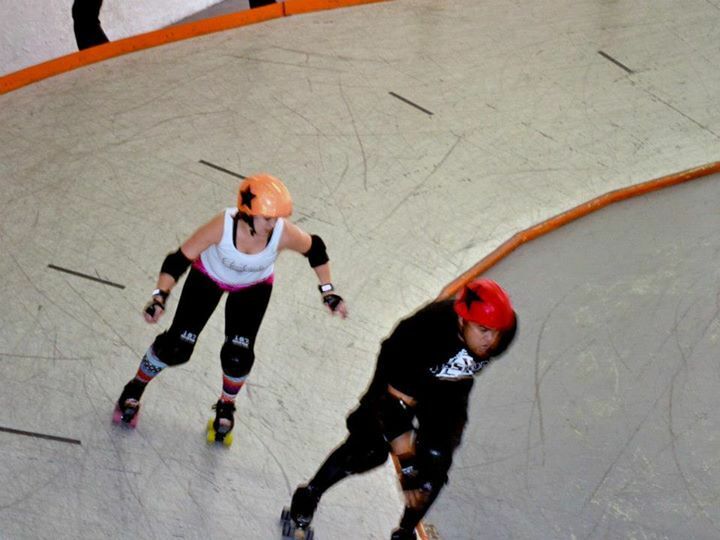 After time away from sports, I began roller derby. 3) How did you become involved with Roller Derby? I started roller derby on Sept. 2012 after being asked to look into being a referee for my buddy's girlfriend's team (Inland Empire Derby Divas). I decided to check it out and ended up joining as a ref. I just completed my first year as a referee. After attending a bank track workshop in Feb. 2013 at the OC RollerGirls facility and the urging of my girlfriend (Kwyet Wryot) to actually participate, it was then that I decided to become a derby skater also. I met Dirty Deborah Harry and she really introduced me to the inner workings of derby (skate maintenance, complete builds, background and history). She Introduced me to many of the OC RollerGirl members and formed the "Chorizo & Eggs" Co-ed roller derby team. I have the best teammates (Pinky Pokerface, Johnny Guns, Payback, Gitmo, T-Dogg, Crafty, Jane Doe, CoCo, Dirty Deborah Harry) that I could ever ask for. They have taught me so much and I couldn't be happier in a team. 4) What teams are you skating with? I skate with Chorizo & Eggs (co-ed team for OC RollerGirls). Currently in process of trying to help create a men's team in Orange County as well. 5) Flat Track or Banked? I skate both Bank and Flat track, although I love bank because of the speed and the constant moving gameplay. No slow derby..."ain't nobody got time for that!" That is a direct quote from Pinky Pokerface! I prefer to take a vicious rock block. I like being hit because I believe it makes me stronger and better prepared for the next hit. Plus I feel alive when a big hit is given...even if I'm on the receiving end. 7) Whats the best part about Roller Derby? The best part of roller derby is spending time with my teammates...even if its not playing derby. We have such a good time hanging out and having fun. My team is my family. 9) Whats the best hit you have given? To date...my best hit would be against my mentor/coach Dirty Deborah Harry...we were scrimmaging and when I hit her, I almost send her flying over the railing (it was not on purpose, I was trying to protect myself from her hit). It was hilarious and scary at the same time, but we both couldn't help but laugh. 12) Where do you shop for all your gear? I purchase my gear from OC Roller Skates! Posted on November 25, 2013 by Select Distribution and tagged Skateboarding Safety Smith Safety Gear skateboard pads Smith Scabs derbylife derbygirls roller derby Derby Dozen.